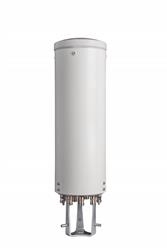 The VVSSP-360S-F from Commscope is a 10-Port Small Cell Antenna with 4-ports operating from 1695 to 2690 MHz, other 4-ports from 3400 to 3800 MHz and 2-ports from 5150 to 5925 MHz. It provides a gain of more than 5.1 dBi and can handle a power of up to 125 W. The antenna has a horizontal beamwidth of 360° and port to port isolation of over 25 dB. This antenna has a length of 600 mm, diameter of 200 mm and comes with 4.3-10 female connectors.